Developer Quote: "A perfect catalyst for children to nurture their artistic abilities, Coloring Book allows for much greater freedom to explore art and personal expression than typical coloring apps." Saturdays used to be a special day spent with my grandmother. She would pick me up and always have a special treat ready. Most of the times this treat was a new coloring book! I treasured those days because I loved my grandmother, and also got to enjoy different themed papers to color with wooden crayons. Children love colors, the more brilliant the better! They love the satisfaction from filling in the lines and seeing a work of art being born. 3D Coloring Book for Kids: Pets provides amazing, eye-popping color in designs that are beautifully rendered and not difficult for little ones. 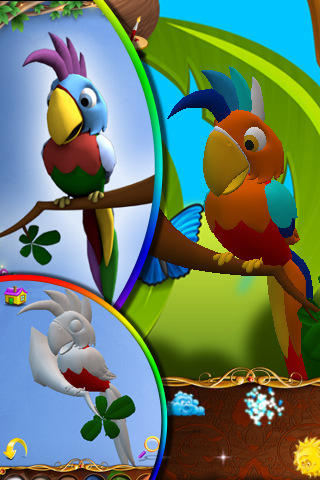 Entertainment is guaranteed with this engaging app! Using the undo and redo buttons takes away the sting of unwanted drawing errors, and a large selection of animals provides hours of entertainment. Want to add a little action to the coloring page? Well, you can insert a bit of animation into your finished drawing if you want, with 3D Coloring Book! Save your child's creations to view or brag about to friends at a later date. COOL CONCLUSION: "3D Coloring Book for Kids: Pets is a charming and lovable collection of pictures you can saturate with color!"